The other day I was on a field trip with my youngest son’s class to see the changes in nature this time of year. We looked at plants, talked about animals, listening to nature’s noises this time of year and how busy everything is. We also had a little net to catch some bugs. Although we weren’t quite quick enough to catch any, we saw butterflies and fireflies, moths and many other bugs. Which got me thinking about how often we find a bug motif in papercrafting. I think butterflies in particular never go out of style. Today for the challenge, I’m challenging you to find ways to use bugs in your projects. 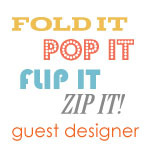 I can’t wait to see all the delightful projects so please, join us here. I’ve always loved interactive journaling cards so when I designed this Bee List stamp last year, it seemed like a fun aspect to include. Because I wasn’t coloring this today, I stamped the image onto yellow patterned paper to accent the bee theme. I’m still working my way through my 8×8 pad of October Afternoon Thrift Shop paper. Hooray for Friday! It’s the Victoria Day long weekend in Canada and the first long weekend of the summer is something to celebrate. I’m actually in Buffalo this morning at the Creating Keepsakes Convention with my sweet friend Becky Olsen. I can’t believe I finally got to meet her after all the hours we spend on the phone. Do you have any long distance friends you haven’t met before? I find it just amazing how the internet can bring people together. I’ll have some photos to share after I get home. We are having FUN! Today I’m back in the CLASSroom with a tutorial on ruffled lace and rolled paper flowers. I hope you’ll join me here. Thanks for stopping by! Have a wonderful Victoria Day weekend! 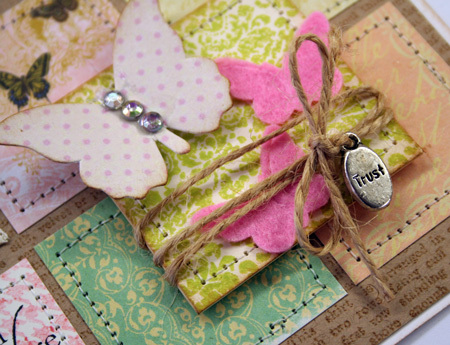 I’ve been fascinated with chipboard since it first hit the crafting market. There is something about dimension on a project that makes me happy. It’s a great product to paint, cover with paper, glitter, ink…whatever. 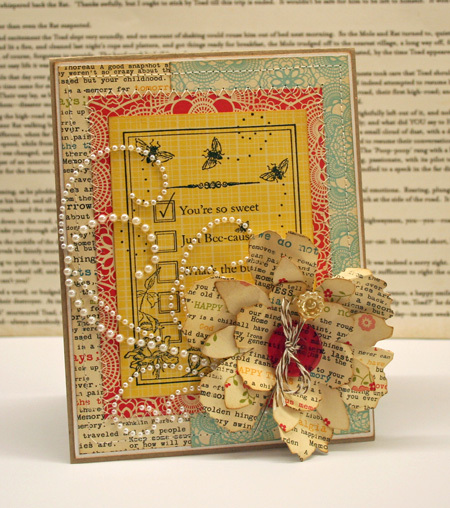 Recently it was suggested to me that I host another chipboard Ways to Use it Challenge. Great idea so here it is. Hope you can play along. It’s always fun to create your own chipboard shapes using some chipboard and a die cutting machine. Craft-a-Board is a chipboard product that is thin enough to die cut and is actually a soft white color so that you can stamp right on it. For my project, I’ve die cut three butterflies from Craft-a-Board, stamped and inked them and lined them up over my stamped background. 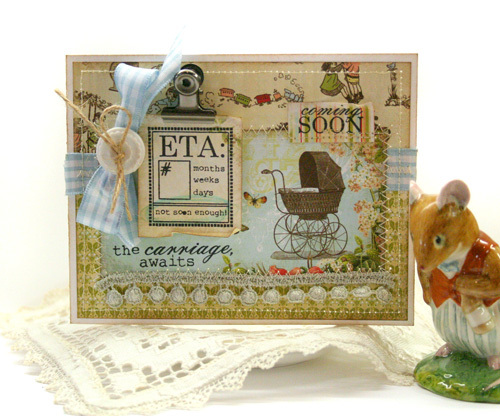 The background stamp is my new Life Scrapblock that was released by CHF a couple weeks ago. Quick Tip: Make sure you use a permanent ink when spritzing with Glimmer Mist or a dye ink spray so that your ink doesn’t run. Here I’ve used Coffee Archival Ink by Ranger with my Glimmer Mist. In celebration of Earth Day, I really wanted to take part in this month’s Splitcoaststampers Dirty Girl Challenge. Those of us playing along today are past or current members of the Dirty Dozen Design Team. 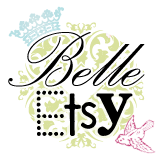 You can check out all the wonderful designs created at this link. There were a few criteria for this challenge, the focus had to be on the earth or nature,the project had to include something recycled and you couldn’t use buttons on it. I love buttons but I managed to create without them today. I have to tell you, it’s just human nature to want to use what you can’t. I kept reaching for those buttons and then reminding myself…no! 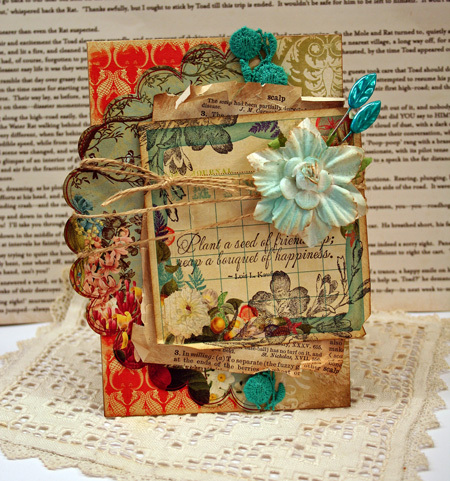 For the recycled part of this design, I used an old vintage dictionary page as one of the layers. You can find touches of nature throughout this design for the patterned papers, the floral stamping and sentiment to the flower and leaf pins embellishments. I admit, I perhaps went a little over the top here but after a busy couple weeks, I’m so excited to get back to creating! 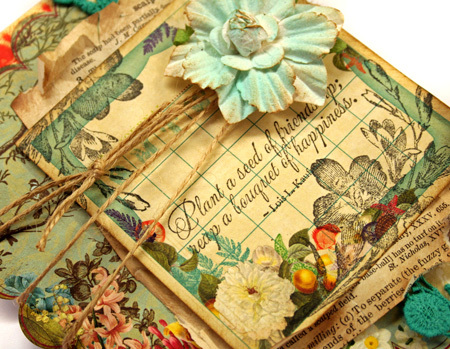 Quick Tip: To alter the white flower, airbrush with your desired color and then lightly sponge the edges for a vintage look. 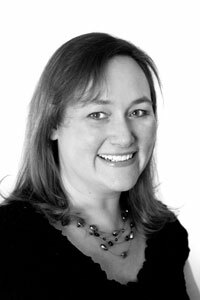 One of the things that really drew me to card making in the first place was they were great ways to stay in touch with family and friends. It’s not just a greeting card you picked up somewhere but something that shows you really care. The other day I found out that a friend of mine has cancer for the second time. My heart just broke for her and her family. The best thing I can do for her is pray fervently but I also sat down and created this card to show I care. I thought about how often I make friendship cards and thank you cards, birthday and Christmas cards but really, encouragement cards are some of the most meaningful. Whoever you are and wherever you are, I know that there must be someone around you who could use a little encouragement. Perhaps it’s a health issue or family troubles or maybe they are a little overwhelmed. Today I’d like to challenge you to find ways to show encouragement by creating a card or project to show you care. And please…just don’t create the project…make sure you give it away. Check out the challenge here. 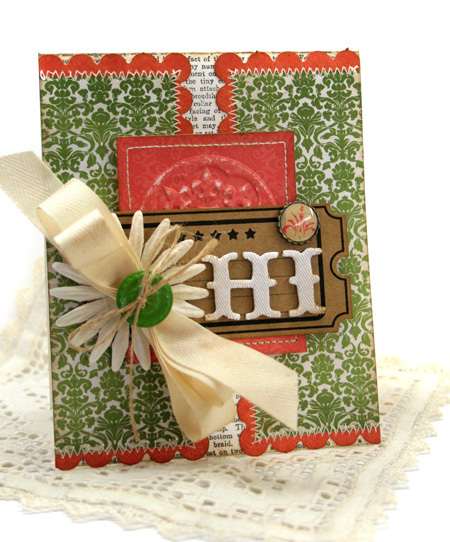 This card is a mix of stamping and pretty paper. I just love combining patterns and pretty colors. If you keep them subtle and keep the design cohesive you can combine almost anything. 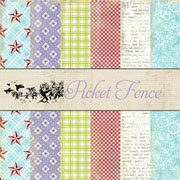 This card design was inspired by one of the Card Maps sketches this month and is a great way to use up your scraps. Quick Tip: Did you know you can stamp and stitch on Inchies? I’ve used this Twinchie to group my embellishments together. I have two projects to share with you today. 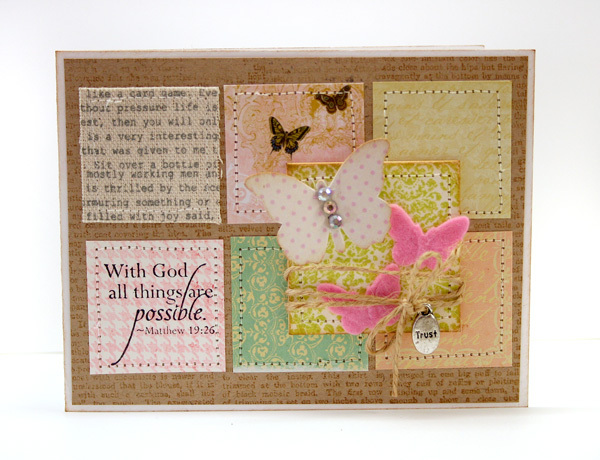 A card and a layout. 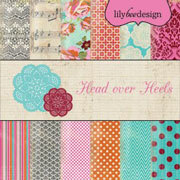 I’m a patterned paper addict and I just can’t bear to through out my scraps. This leads me to thinking of ways to use them up. 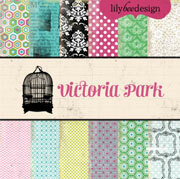 Today’s projects use up some Lily Bee Design paper from their Vintage Poppy line. I had just enough to put together a simple layout and a card. What I really had fun with on these projects is the Vintage Poppy Frame Die-Cut sheet. On the layout I cut one to frame the top and bottom of my design and by cutting a frame in half and switching the orientation of the paper, it looks like a fun center-opening layer. Quick Tip: Glimmer Screens don’t just have to be used with Glimmer Mist. Try them with paint. 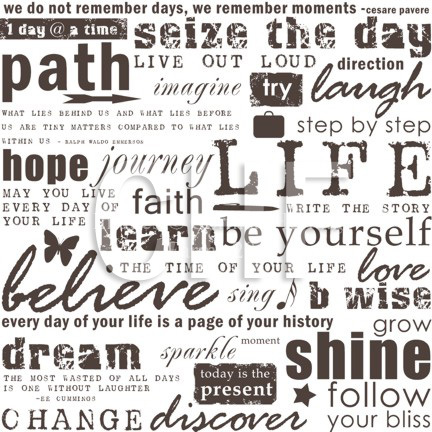 Have a simply wonderful Saturday! It’s no secret that I love new product. It’s always so much fun to play with! Yesterday some paper and goodies I ordered came in the mail and I just wanted to play with them. Last week’s WT challenge was a tricky one so this week, I thought I’d make it super easy. Most of you will have some new goodies in the house. Those recent CHA releases are super hard to resist. 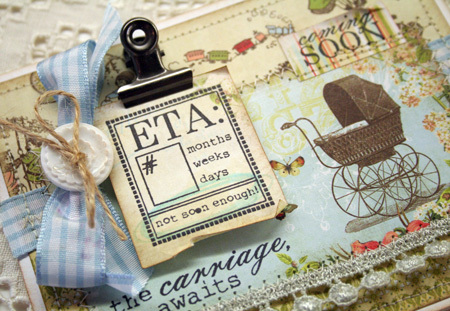 Create a project that shows off your new stamps, papers or other product for an easy challenge today. Check it out here. 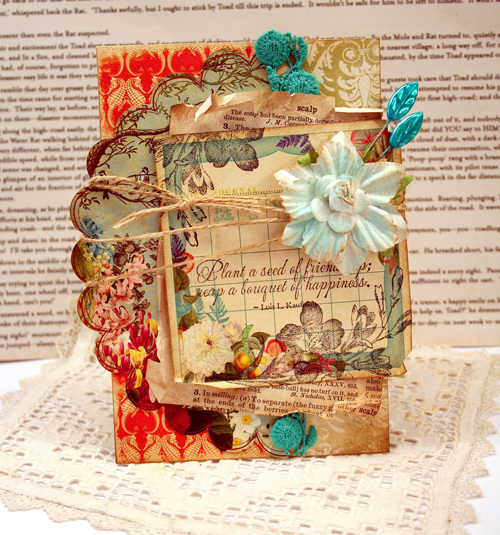 I decided to put a double spin on the challenge and create a baby card with my new Webster’s Pages Lullaby 6×6 paper pad. Nothing as fresh and new as a baby. I adore them. While the stamps aren’t new, I hadn’t even cut out a couple of them yet so they are “new” to me. I’m adoring vintage at the moment. 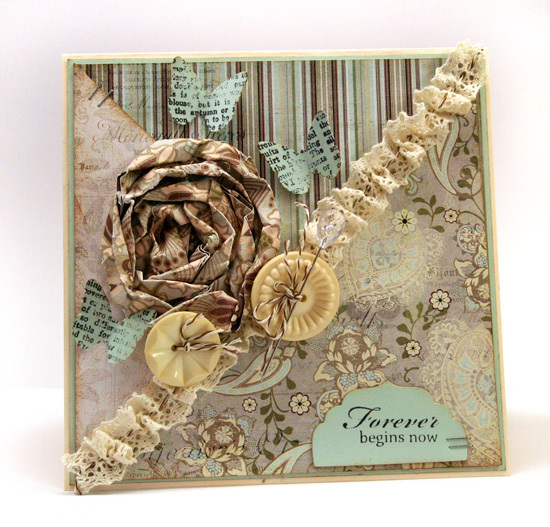 The layers, distressing and pretty details are so fun to work with. I’ve stamped right on the patterned paper here to add interest to each layer. Quick Tip: Some stamps are designed to be interactive. Write in the amount of time left or circle not soon enough for a personalized design.